Portable:Invisible zipper, fashionable appearance design. Vogue:Enable you to carry your MacBook / laptop / notebook / Ultrabook computer in a uniquely sleek style. Soft:Furry interior protects tablet and phone accessories against scratching. Light Weigh:The laptop bag is slim, great for carry alone. Suitable for:MacBook Air 13, MacBook Pro Retina 13 Late 2012 - 2015, Old MacBook Pro 13 with CD-Rom 2008 - Early 2012, 12.9 iPad Pro 2017, Microsoft Surface Book 13.5, Surface Laptop 2017, Dell Inspiron 13 5000 2 in 1, 2017 HP SPECTRE X360 13.3 2 in 1, HP Envy 13, HP Stream 13, HP Pavilion 14, Lenovo Yoga 720 13.3, Acer Swift1 13.3, Acer Swift7 13.3, Acer Swift5 14, Acer Spin7 14 and most popular 13-13.3 inch Laptops/Notebooks/Ultrabooks;may not snugly fit all computers in different models. With any problems,please don't hesitate to contact us before you leaving feedback or review,we will offer you the best service and try our best to help you.Sincerely Thanks! 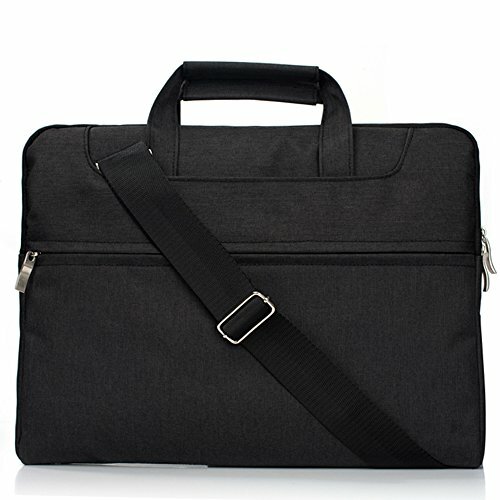 Portable business briefcase, invisible zipper, fashionable appearance design. Enable you to carry your MacBook / laptop / notebook / Ultrabook computer in a uniquely sleek style. Soft furry interior protects tablet and phone accessories against scratching. The laptop bag is slim and light weigh, great for carry alone. If you have any questions about this product by YiMiky, contact us by completing and submitting the form below. If you are looking for a specif part number, please include it with your message.